Another wine harvest has come and gone. The 2015 harvest in California was less than some anticipated. Some vineyards were down 30%. We had the same issue at the winery I am helping at. We had contracted Cabernet Franc from the Sierra Foothills. The grower had contracted 15 tons to our broker. Unfortunately after harvest, they ended up with 5 tons. I am not sure how this could be. If you are a grower you must have an idea what your crop looks like and the anticipated yield. We did get lucky and was able to get Cabernet Franc from Washington State. The Cabernet Franc is sitting in the barrel now and is tasting great! My Birthday is early November. We were done with the crush, fermentation and pressed the fruit. 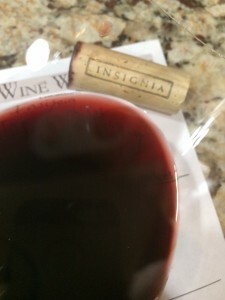 Besides celebrating my birthday, it was time to celebrate my first winemaking vintage. There were three celebration wines that came to my mind. Verite, Shafer or Joseph Phelps. Moderate to aromatic notes of earthy, plum, dark fruit, blueberry and cherry. Dry, full-bodied with great acidity. The tannins were soft. Silky-rich soft mid-palate with a velvet finish. Blend: 95% Cabernet Sauvignon, 5% Petite Verdot. We processed 20 tons of Minnesota cold hardy along with California and Washington fruit. I worked hard. Even though I was tired and woke up some mornings with a sore back, I enjoyed every second of it. This February I will take the month off of work and travel to South Africa. Where I will be helping David van Velden of Overgauux Estate during the 2016 harvest. 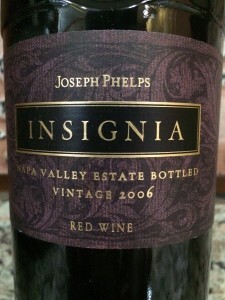 I rated the 2006 Joseph Phelps Insignia four glasses.